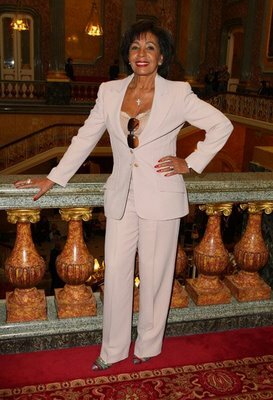 Dame Shirley attended Julien MacDonald’s show at Lancaster House this week. She looked beautiful in a pale pink trouser suit. Julien MacDonald designed Shirley’s gown for her last tour and also the gown she wore for her appearance at Glastonbury. DAME Shirley Bassey made a surprise appearance at a London fashion show last night in what is believed to be her first public appearance since a stomach operation. The 71-year-old diva, pictured yesterday, was taken to hospital in May. She suffered abdominal pains at her home in Monaco and had to have emergency surgery. But yesterday, the Cardiff legend looked to be back to her glowing best, appearing in a pale pink suit to cheer on fellow Welsh celebrity Julien Macdonald as he released his Spring Summer 2009 collection in London. Other guests included singer Katherine Jenkins. Macdonald chose the grand 18th-century Lancaster House, near Buckingham Palace, for his show. She also attended the Jaeger show and the above photo shows her sitting on the front row wearing a beautiful black lace dress. She certainly does look great in these two photos.